World heavyweight boxing champion Tyson Fury has apologised for any of his comments which "hurt anybody". Around 40 people protested outside Sunday's SPOTY awards ceremony. At the ceremony, the British fighter said: "If I've said anything in the past that's hurt anybody, I apologise." 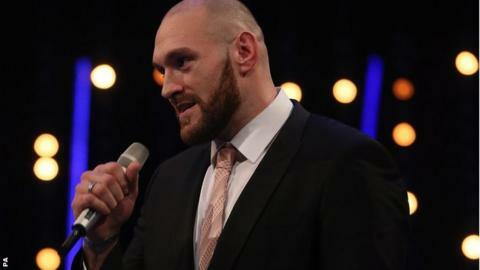 Some of the 7,500 audience at the SSE Arena booed Fury's name as it was read out as one of the 12 in contention for the Sports Personality award. The Manchester boxer, who outpointed Wladimir Klitschko to become heavyweight champion last month, finished fourth in the vote, which was won by tennis player Andy Murray. Fury caused controversy over derogatory remarks he made about women, and for criticising homosexuality and abortion. Asked about his remarks by Gary Lineker in a live on-stage interview at the Belfast event, Fury said: "I've said a lot of stuff in the past and none of it with intentions to hurt anybody. "It's all very tongue in cheek, it's all fun and games to me. I'm not a very serious kind of person - it's all very happy-go-lucky with Tyson Fury."